Whenever my guests on a city tour of Berlin feel less inclined to have lunch in a restaurant, more often than not we end up at a place selling Currywurst. For all those not familiar with this culinary delight: Currywurst is a fried sausage, cut into slices and served with a curry-flavoured ketchup sauce. So far, this meal, usually served with French fries red/white (ketchup and mayonnaise! ), along with a good German beer has always left my guests utterly satisfied. The Currywurst is the typical fast-food of Berlin. It belongs to the city like the hot-dog belongs to New York or fish & chips belong to London. And it has seen an astounding revival in the past few years. The Currywurst was invented by a lady called Herta Heuwer in September of 1949. She was the proud owner of a food kiosk on the corner of Kant- and Kaiser-Friedrich-Strasse in the Berlin district of Charlottenburg. Herta Heuwer was the first to serve a bratwurst (= fried sausage) with an exquisitely seasoned ketchup sauce. When I grew up in Berlin, there were hundreds of these Currywurst kiosks in Berlin. Until a few years ago, less and less Berliners and virtually no tourists at all were interested in the Currywurst. A slow but steady demise of the traditional Currywurst kiosk had set in. The Döner Kebap had surpassed the Currywurst as the standard snack of Berliners. Just for the record: the Döner Kebap was also invented in Berlin! As the Currywurst declined, so did the number of typical Berlin restaurants in the city. Nobody wanted German food anymore. People preferred to patronize Italian, Greek or French restaurants; international was the trend. It was only with the renaissance of German cuisine that the Currywurst regained its popularity and more and more food kiosks put it back on their menu. In 2009 Berlin’s scope of museums was graced with a new arrival: The German Currywurst Museum. There is Currywurst with and without skin. The skinned variety is firmer and usually crispy. The skinless variety is a little softer. In both cases the sausage is seasoned with a good helping of curry and paprika powder. Most people enjoy their Currywurst with either a bun or a side of French fries topped with ketchup and/or mayonnaise. 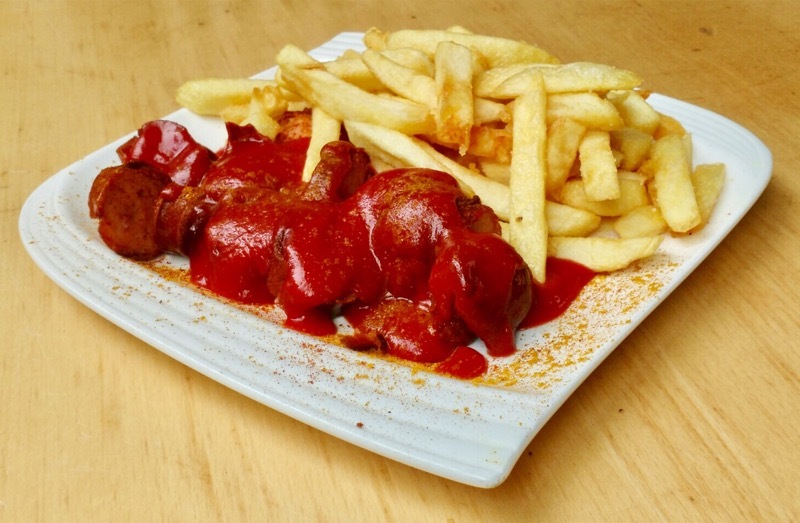 Every Currywurst lover has their favourite variation. Have it with raw or fried onions, “normal”, “spicy” or “very spicy”. Some kiosks offer a variety of sauces whose spiciness is measured on the Scoville scale. There are even competitions the winner being whoever can eat the most spicy Currywurst. For some participants this got them straight to the emergency room as extreme spiciness can trigger hypertension as well as hypothermia. Just as with restaurants, many Currywurst kiosks are just average at best and only a few can claim an offer that pleases the highest demand in both quality and taste. 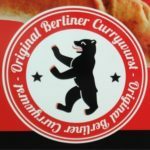 My personal favourites are “Curry 36” on Mehringdamm and Zoo Station and Jenny’s Currywurst, a mobile stand found in different locations during the week: Wednesdays and Saturdays on the local market on Mierendorff square in Charlottenburg, on Tuesdays and Fridays on the market on Rüdesheimer Platz in Wilmersdorf.